India on Sunday exuded confidence that the current impasse over the Trade Facilitation Agreement and food security in the World Trade Organization would be resolved but also indicated such a resolution might not come soon as it stood firm on its stance over food subsidy to the poor. Commerce and industry minister Nirmala Sitharaman also castigated the Bali package, signed during the previous United Progressive Alliance regime, as distorted and imperfect, hurting the sovereign rights of India to feed its poor and procure from farmers living on subsistence farming. Addressing the India Global Forum in New Delhi, she rejected suggestions given by some countries in the October talks in the WTO that a resolution to the problem be found out by some countries, leaving others. The forum was organised by the International Institute of Strategic Studies and Observer Research Foundation. An implementation of the TFA, as agreed in Bali, was derailed in the July talks after India asked the WTO members to also ink an agreement on food subsidies given to the poor. “I have seen that between July and now, there is greater understanding, there is greater appreciation, and engagement with the WTO. The Prime Minister’s visit to the US gives us a feeling that the US is also greatly appreciative of what we are narrating. I hope that there will be a solution because multilateralism will have to remain sustained and be empowered,” Sitharaman said. After July, talks in October in the General Council also failed. Now, the council will meet in December. WTO director-general Roberto Azevedo had said in October that even if an agreement on the TFA was inked tomorrow, the deadline to implement it by December can’t be met. For any resolution of the logjam, the US and Europe would have to agree to India’s stand on food security. “We are with you on the TFA but be sure you understand our case. “Otherwise, these very economies will come back to us and lecture us that the Government of India does not take care of the starving millions. “We want no such lectures. We will take care of our starving millions,” Sitharaman said. She added that India’s demands are legitimate, requiring peace clause to be extended and then permanent solution to the food subsidies problems be found. According to the WTO’s agreed formula, food subsidies have to be capped at 10 per cent of total agriculture production at 1986-88 prices for developing countries. The United Progressive Alliance government had signed the TFA in Bali under a peace clause that gave developing countries exemption from the 10 per cent until 2017. It came at a time when India has been preparing to roll out the Food Security Act, which gives cheap food to 67 per cent of the population. “We want you to understand that let the peace clause co-exist until such time that you don’t get us a permanent solution,” Sithraman said. Pointing out that the 10 per cent cap on subsidies is based on 1986-88 prices, she said: “Is that right? Do you agree on that? The commerce and industry minister also reminded the West that it also gives food subsidy, but doesn’t call it so and doesn’t bring it on the table. 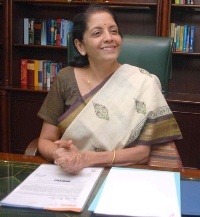 Sitharaman reminded the WTO that decisions have to be taken on a consensus basis. “You are not going to isolate any one decision and isolate any one country. “Decisions are not about one country but all issues. This is a principle which guides the WTO. “How could you then isolate trade facilitation and say all of us want that trade facilitation?" She reminded the developed world that after getting the TFA package in Bali, it forgot about the developing world. “After having got it, would you come back to us and say our problems are taken care of. The minister said these arguments are not intended to weaken the WTO, these are arguments to remind the WTO of its own stated principles. “You will not agree on any one thing, till you agree on everything. The minister also asked the WTO to change the way it engages with the emerging market economies and recognise the fact that solutions to the problems in advanced world lay in the hands of the Expanded Middle East. Azevedo recently said some members sought the implementation of the TFA as a plurilateral pact as part of the three alternatives to end the impasse over food security.